I plan to visit my in-laws this April. I am always trying to impress them (aren’t we all?) and I wanted to flaunt my knitting skills. I decided to make a sweater for my nephew-in-law (errr…). This is my first sweater. I chose Daisy because the pattern is simple and beautiful. 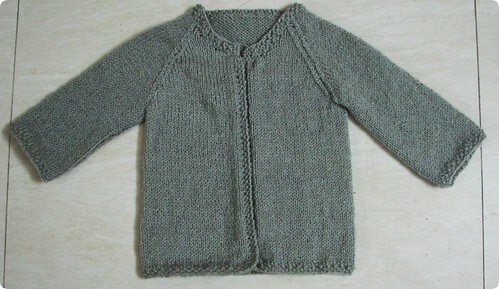 This sweater is knit in one piece for the body and then divided for front left, front right and back. I know oh-so-boring grey is not really for kids, but I still used it for two reasons: One, I didn’t know this sweater would turn out well enough for it to be gifted. Second, I wanted to use that yarn. I had loads (and still have 2 skeins left) of it and wanted to use it up. Once the sweater was done, it looked so plain and boring! I had to spice it up by adding a few daisies (as given in the pattern) and a few borders on the sleeve. I also added buttons made of yarn. 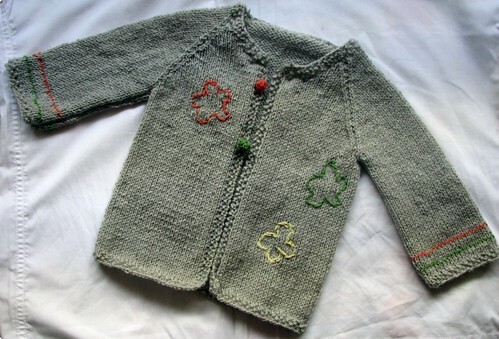 These are just decorative – I am going to added “press buttons” for the sweater. Now the sweater is see-able. One daisy out of the three didn’t come out well: I amputated one of its petals. The duplicates stitched border on the sleeves almost represent the Indian flag which was completely unintentional. One border row is so off the track, as if it is drunk – it goes up and down, and up and down. Or was I drunk while knitting it? As usual, lots to learn. Seed stitch, dividing stitches, raglan shaping, mattress stich for seaming, backstich for the daisies, duplicate stitch for the sleeve border. All in all, end result: an ok-ok sweater. I think it is good enough, so I am going to give it, after all. Another great sweater – you keep whipping out the knits so fast, your needles must be flying!!! Have fun at the in-laws’! Ha ha, I don’t know about my needles flying, but I dream of knits and purls and k2togs for sure!